The Nassau grouper: an endangered, boldly striped fish that was once plentiful in southern coastal Florida, the Florida Keys, Bermuda, the Yucatan, and the Caribbean Sea. This iconic species gathers into massive spawning aggregations, which makes them an easy target for fishers. For more than 20 years, conservationists in the Caribbean have been working to protect this endangered species, and thanks to their efforts, populations of this critical reef fish have even stabilized in some areas. In a new paper, Nereus researcher Rebecca Asch reported that climate change may undo those efforts by the end of this century. Due to projected changes in water temperature, 82% of Nassau grouper breeding habitat will be lost by 2100 if nothing is done to mitigate climate change. These spawning habitats are critical to the survival of the species. Additionally, habitats for non-spawning fish are expected to decline by 46 percent. 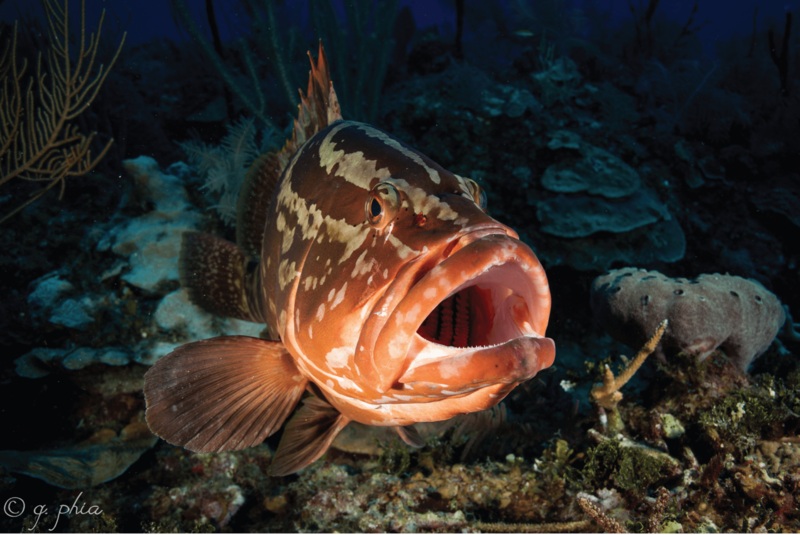 The Nassau grouper is one of the most recognizable reef fish in the Caribbean and as a top predator, the fish contributes significantly to the ecosystem and can act as a kind of canary in the coal mine for reef health. This finding doesn’t only impact one species, however. Water temperature and seasonal timing of temperature changes in the ocean play pivotal roles in the spawning behavior of hundreds of fish species. If fish are forced to change their behavior to avoid unfavorable conditions, the future of their species could be at risk. “To truly understand how climate will impact fishes, we need to know how it will impact the most vulnerable life history stage, spawning. If this link in the life cycle is jeopardized, the species as a whole will be in jeopardy,” said Nereus fellow Rebecca G. Asch, an assistant professor of fisheries biology at East Carolina University. fraction of their historical population size, and the fish was declared an endangered species. A variety of conservation efforts were enacted; beginning in the 1990s, several countries including the U.S. put outright bans on fishing Nassau grouper. In Cuba and the Dominican Republic, authorities restrict fishing during spawning season while the Cayman Islands protect specific breeding grounds from fishing. Large breeding events, called spawning aggregations, are important for the health of the ecosystem. Large predators, like sharks, feed on the gathered grouper. Whale sharks and manta rays feed on the eggs that are released. “The loss of these important, energy-rich events has negative impacts that span entire ecosystems,” Erisman said. If strong steps are taken to mitigate climate change, breeding habitat is projected to decline by only 30 percent. Next, the scientists plan to expand their research to look at how climate change may affect spawning in 12 species of grouper and snapper in the Caribbean. The model developed could aid researchers in studying climate change impacts on other fish species that depend on large spawning events, like salmon. Sourced from Esther R Robards-Forbes.